Once you select the device from the device list, click Start scan, specify all the preliminary settings in the Filesystem scan parameters window, and click the Start button from there, ReclaiMe Pro starts searching the device for the filesystem structures. As soon as the software discovers something, on the left you will see root folders named after the found filesystems. Clicking a root folder displays all the subfolders of a particular filesystem. Note that ReclaiMe Pro doesn't display empty folders. When clicking any folder on the left, on the right you can see the files belonging to the folder. Next to every folder there is a checkbox using which you can mark the specific folders for data extraction. A gray intermediate checkbox means that one or several (but not all) subfolders of the folder have been marked. 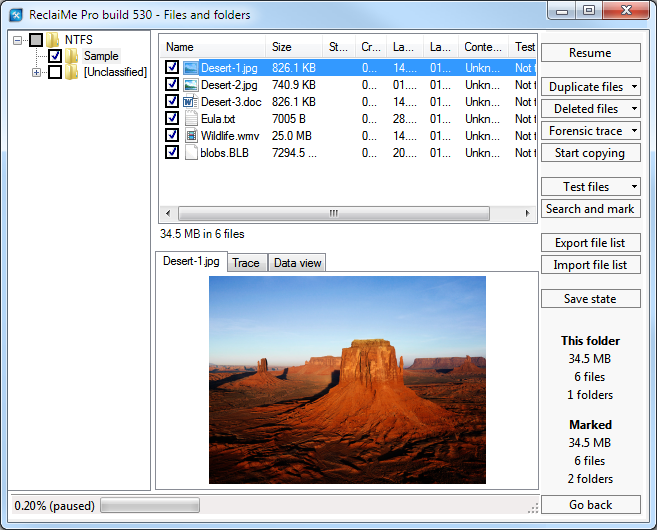 When you click a file on the right, ReclaiMe Pro displays the preview of the file given that the file format is supported; otherwise, you get a hexadecimal view of the file content. Also, in ReclaiMe Pro there is a special Trace tab where you can find forensic trace information for each file displayed. Please refer to the Forensic trace page for more information about trace format. The forensic trace is available only when there is no filesystem scan running, that is, when the scan is either finished or paused. Additionally there are two more columns content type and test results which provide more information about a file. These columns become informative only if you click Test files button. You can find more information about this feature below. Clicking a column header allows you to sort the file list by that column attribute. Files as well as folders have checkboxes allowing you to mark specific files for copying. If you need to recover a specific file or folder, consider using the search capability of ReclaiMe Pro. Number of marked files does not change without your explicit request. Total size of marked files may increase as ReclaiMe Pro discovers new fragments of data for the files you have already marked. Number of marked folders may change as more folder tree structures are recognized and some folders get shifted around. Before you start copying the recovered data, you need to decide how duplicate and deleted files should be processed. names of two files on Linux filesystems differ only in letter case. You can choose either Copy all files (default option) or Skip deleted files. It works only for those filesystems where it is possible to detect whether a file was deleted. If it is impossible, all files are copied. Note that you cannot save the recovered data with a trial key of ReclaiMe Pro. For non-trial license keys, the button is enabled if at least one object (file or folder) is marked for recovering. Once you click Start copying, you need to specify the location where all the marked objects should be restored to. Note that you can estimate the amount of marked for copying objects by looking at the Marked field at the bottom of the window. Marked field provides both the total size and the total number of the marked files and folders. Once you have specified a location for the recovered data, you see the File copying window where you can find a lot of information about current data extraction process like target path, the size and the number of recovered files to be copied, and so on. In addition, you can adjust the size of write cache using the Write cache size setting next to which the current percentage of write cache in use is displayed. If you copy the recovered data to a slow target (network, NAS, or external hard drive) and there is enough RAM in the system, increase the write cache size. If you deal with a fast target, normally you should not use write cache. Keep in mind that once a marked folder is successfully copied, ReclaiMe Pro unmarks it along with all the files and subfolders stored in this folder. If copying is interrupted, the last folder fully copied is unmarked, and the folder that was being copied at the time of interruption is left marked. The button allows you to pause the data recovery process anywhere and then resume the process from the same point. Note that if you select the Filesystem scan first, then deep scan, with pause (recommended) mode in the Filesystem scan parameters window, some short time into the scan (usually within three percent) ReclaiMe Pro displays a message stating that the initial scan is complete, pauses the scan, and changes Pause to Resume. This feature is not available on the FAT16 filesystem. To see forensic trace information in the evaluation version of ReclaiMe Pro you need to switch to the Trace tab. For more information about this feature please visit Forensic trace page. Whether file extension matches those ReclaiMe Pro was able to detect. File validity namely how ReclaiMe Pro estimates the quality of the file for example good or bad content. File hash values (MD5 and SHA-1). For more information about this feature please refer to the Test files page.